This teak coffee table measures an impressive 51 inches wide by 35 inches deep and 14 inches high. This table has other impressive dimensions as well; just over 6.5 inches wide is another such impressive measurement. 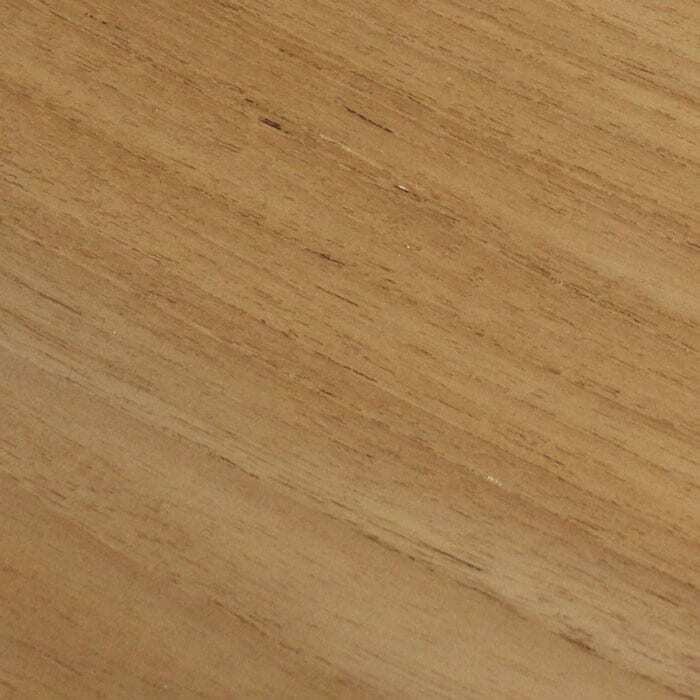 That’s the width of each of the 51 inch long; 1-inch thick planks of teak that make up the table surface. 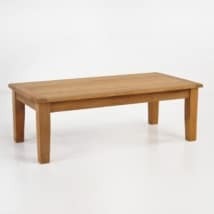 W35" x L51" x H14"
This teak coffee table is a reminder of how beautiful teak is when presented in such a prolific way. It’s also a perfect rendition of a teak coffee table for this collection (Soho), with it’s design being directly influenced by the design of the seating pieces. The Soho collection, as you may already know, has a couple of impressive teak coffee tables within the collection. 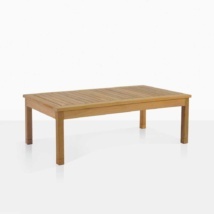 To compliment this rectangle offering is a monolithically proportioned round teak coffee table. Either table compliments the existing pieces of this collection. 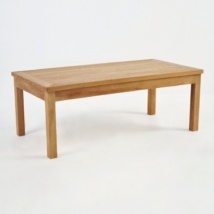 Simplicity and stature are key cornerstones of this teak coffee table, with it’s wide planking and flat profile. The impact of this table is clear in any setting, and the attention to detail is interesting too, with a stainless steel rod in the middle of the planks connecting them perpendicularly. This single touch hints at the bold attitude of this teak coffee table even if it seems a bit muted in pictures. 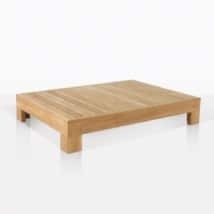 This teak coffee table is such that it can also work well in a ton of other scenarios too. The A-Grade teak planks are incredibly hard to source compared to the majority of teak on the market. They provide an excellent surface continuity to allow for graceful and consistent outdoor aging. Because the surface is so flat and broad, the silvery grey color of aged teak will be more even than a table with a more complex face. From an indoor perspective as well, this piece is bold and interesting, because it works so well in contrast to so many other pieces. 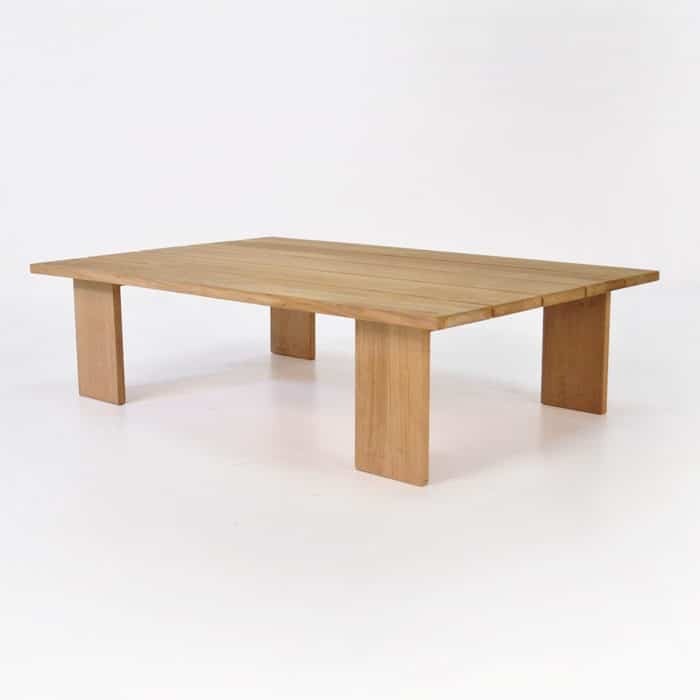 It’s rare that you can find a piece of accent furniture that has such a large presence of beautiful wood in proportions like the one in this teak coffee table.